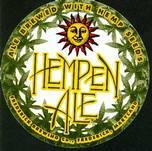 Organic hemp-seeded dank-scented ale with molasses-sapped caraway influence and carrot-caked quip proves to be piquantly peculiar toxicant. Assuring grain-malted burnt caramel sweetness, mellow herbal tea sequence, and leafy dampness relegate strong alcohol content. Serve to glaucoma patients.